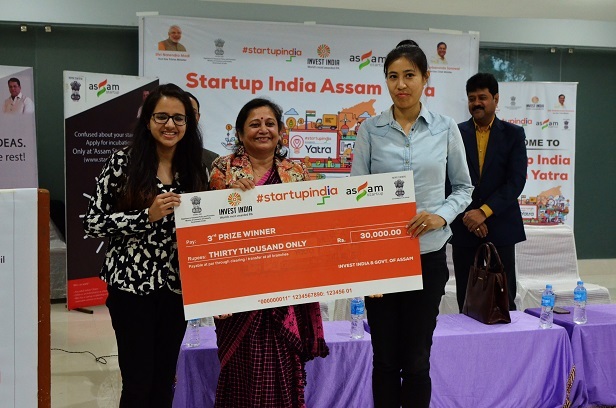 Startup India, Ministry of Commerce, Government of India in collaboration with Department of Industries and Commerce, Government of Assam successfully conducted a 15 days long startup and entrepreneurship awareness drive called ‘Startup India Assam Yatra’ for the state of Assam. Flagged off by Assam chief minister Sarbananda Sonowal on January 20 last from the Assam Startup – the Nest at Ambari, Guwahati, the ‘Yatra’ concluded on Tuesday with a grand finale at the Nest premises. More than 1,000 budding entrepreneurs were impacted during the 10 boot camps and 15 van stops that were organised in various districts of Assam such as Kamrup (M), Kamrup (R), Tezpur, Jorhat, Dibrugarh, Tinsukia, Lakhimpur, Udalguri, Nalbari and Dhubri. More than 100 ideas were pitched during the journey, out of which 35 teams were selected to pitch their ideas in the finale at Assam Startup – the Nest. Addressing the gathering, Manjula Saikia Bhuyan, joint secretary, Industries and Commerce Department, thanked DIPP, Startup India Team and SingEx Team for their endless efforts to make Startup India Assam Yatra successful. She also encouraged the young participants to keep innovating for the betterment of the society. Cash prizes worth Rs 1,50,000 were distributed among the top five winners of grand finale. The winners include Arnab Kumar Burman from Gauhati University (1st prize); Krishnanya and Ravi from Dispur (2nd prize); Vandana from Dispur and Muscan from Dhubri (3rd prize); Mukesh from Dispur and Arohan Group from Nalbari (4th prize) and Prakarshit Saikia and Debleena from Tezpur University (5th prize). Judges Pranjal Konwar, COO, Assam Startup; Aaquib Hussain – Founder, I&We and Aakarshan Sethi – Manager – Startup India Yatra Project (SingEx India Team) were also present on the occasion.